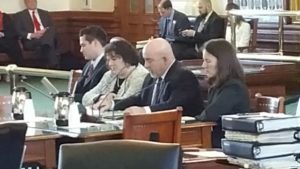 Tara Sander Lee, Ph.D., (Right), presenting her testimony at a hearing on Texas Senate Bill 8 on February 15, 2017. Written Testimony of Tara Sander Lee, Ph.D. Thank you for the opportunity to testify before you today in support of SB 8, regarding the regulation of human fetal tissue in research. I am a Molecular and Cell Biologist with over 15 years of experience in research and healthcare related to childhood disease. I earned a PhD in Biochemistry from the Medical College of Wisconsin, followed by postdoctoral training at Harvard Medical School and Boston Children’s Hospital. My research has involved the study of vascular disease, cancer, and more recently, Sudden Infant Death Syndrome (SIDS). I also direct a molecular diagnostics lab that performs genetic testing for children. As such, I am testifying as a scientist with first-hand knowledge of research and clinical applications involving human tissues. I am also a Christian, with a deep belief in our Creator and compassion for all stages of life (from conception until natural death). Exploiting even one unborn child is unacceptable – no matter what the outcome might prove or promise to be. These children have a right to the same respect owed to every person, regardless of developmental stage. But enough about me, let’s look at the facts. Fact #1: There have been no cures from abortion-derived human fetal tissue. This was recently confirmed by the US House Select Investigative Panel after a yearlong investigation of the abortion industry, which uncovered evidence on the trafficking of human fetal body parts for research. Scientists that use aborted fetal tissue claim that they “need” these tissues, because they provide the “best option” for studying devastating diseases such as Alzheimer’s and spinal cord injury. Yet, the numbers defy these claims. Even Dr. Goldstein, Professor and Director of the UC San Diego Stem Cell Program, who testified on behalf of those who use fetal tissue admitted that he is “not aware of any [therapies] that have been definitely solved using fetal tissue.” The reality is that no current treatments or therapies exist that require aborted fetal tissue. Fact #2: Abortion-derived human fetal tissue is not critical for research or clinical trials. Restricting the use of aborted fetal tissue will not bring research and clinical trials to a halt. Fetal tissue is making a negligible contribution to science. In a recent five-year period (2010-2014), only 0.2% of grants funded by the National Institutes of Health (NIH) and only 0.01% of the clinical trials use fetal tissue. And none of the grants or clinical trials on Alzheimer’s use fetal tissue, which is often falsely stated as being “required” for this field. Alarmingly, 20% of clinical trials using fetal tissue “have been withdrawn, suspended, or terminated– more than twice the rate seen for clinical studies using non-fetal stem cells.” Contrast this to the over 5,800 successful clinical trials using non-fetal stem cells to treat diseases that are already advancing to phase II and phase III trials. Fact #3: Non-fetal tissue sources are available to researchers and saving lives today. Tissue cores exist that provide researchers with human tissue samples donated by patients, such as placenta, umbilical cord, cord blood, and various leftover tissues from surgeries. Human cadavers are another valuable tissue source, in which stem cells can be isolated several weeks after death. Scientists can also “reprogram” adult somatic cells (such as skin cells) to induced pluripotent stem cells (iPSCs) resembling an embryonic-like state. Furthermore, human adult tissue, cord blood stem cells and iPS cells can form “organoids”, in vitro 3D cellular clusters replicating normal organ function. Donations from miscarriages are also useful and ethical solutions for those who want to use fetal tissues. Regarding therapies, insulin for diabetes and Herceptin for breast cancer have been developed in non-fetal cells. Cord blood is a rich source of stem cells treating thousands of people with blood disorders. And adult stem cells have saved the lives of over 1 million people worldwide, but not one person is alive today because of stem cells from aborted fetal tissue. Texas is at the forefront of adult stem cell therapy. MD Anderson’s Stem Cell Transplantation and Cellular Therapy Center is one of the largest facilities in the world for stem cell transplants, performing more than 850 procedures each year to treat cancer, blood diseases and autoimmune disorders. Researchers at The University of Texas Health Science Center at Houston (UTHealth) are using a patient’s own stem cells to treat traumatic brain injury. The Stem Cell Center – Texas Heart Institute has numerous clinical studies using adult stem cells to treat heart disease. And finally, The San Antonio Orthopaedic Group (TSAOG) uses stem cell therapy to treat degenerative orthopedic conditions. In conclusion, I applaud the Texas legislature for bringing this bill forward—lives will be saved. Your support of this bill will send a strong message that you support the best science without ethical compromise. I urge those that stand in opposition of this bill, do not be deceived by the many false and misleading assertions regarding the role of aborted fetal tissue in medicine. We must stop harvesting baby body parts in this country and invest in the discovery of treatments that have real promise of healing patients now and in the future. S.I. Hodgetts, et al., Long live the stem cell: The use of stem cells isolated from post mortem tissues for translational strategies. The International Journal of Biochemistry & Cell Biology, 56:74–81, 2014. Choi J. et al., A comparison of genetically matched cell lines reveals the equivalence of human iPSCs and ESCs, Nature Biotechnology 33:1173, 2015. Habibollah, S., Forraz, N., and McGuckin, C.P., Application of Umbilical Cord and Cord Blood as Alternative Modes for Liver Therapy in: N. Bhattacharya, P.G. Stubblefi eld (eds. ), Regenerative Medicine: Using Non-Fetal Sources of Stem Cells (Springer-Verlag, London, 2015), 223-241, doi: 10.1007/978-1-4471-6542-2_22. See also Fatehullah, A., Tan, S.H., and Barker, N. Organoids as an in vitro model of human development and disease. Nature Cell Biology, 18:3, 2016. Michejda, M., Spontaneous miscarriages as a source of fetal stem cells. The national catholic bioethics quarterly, 2:401, 2002. See also Michejda, M., Which stem cells should be used for transplantation? Fetal diagnosis and therapy, 19:2, 2004. See also Virgintino, D., et al., Astoglia-microvessel relationship in the developing human telencephalon. Int. J. Dev. Biol., 42:1165, 1998. See also Kang, X., et al., Granulocytic myeloid-derived suppressor cells maintain feto-maternal tolerance by inducing Foxp3 in CD4+CD25-T cells by activation of the TGF-b/b-catenin pathway. Mol Hum Reprod, 22(7):499-511, 2016. See also Low, W.C., et al., Human fetal tissue from spontaneous abortion as potential sources of donor tissue for cell transplantation therapies. Transplantation Proceedings, 26:1, 1994. Agrawal, V. and M. Bal., Strategies for Rapid Production of Therapeutic Proteins in Mammalian Cells. BioProcessTechnical, 10(4): 32, 2012. See also Li, F., et al., Cell culture processes for monoclonal antibody production. MAbs, 2(5):466, 2010. Roura et al. The role and potential of umbilical cord blood in an era of new therapies: a review. Stem Cell Research & Therapy, 6:123, 2015; http://www.nationalcordbloodprogram.org/. Gratwohl, A., et al., One million haemopoietic stem-cell transplants: a retrospective observational study. Lancet Haematol, 2(3):91, 2015. See also http://lozierinstitute.org/fact-sheet-adult-stem-cell-research-transplants/. Cox, C.S. et al., Treatment of Severe Adult Traumatic Brain Injury Using Bone Marrow Mononuclear Cells. Stem Cells. 2016 doi:10.1002/stem.2538 [Epub ahead of print].